Note : This offer is currently no longer available. However visit our home page to know about exciting offers everyday. Super Bonus Offer will be active only Between 6:00 pm to 10:00 pm on every Wednesday & Saturday. RummyCulture brings to you Special Super Bonus. We are here to make you feel special at RummyCulture & this is the most exciting thing for you to get the best bonus of all times. Get Unlimited Bonus with unlimited times of add cash during this time. Add any amount above Rs 5000 & Get Free Super Bonus Upto Rs 4000. Get unlimited amount during this the offer period on your Cash deposits. You can add unlimited times & each time you add cash you can Use any of our Free Booster offer according to your deposit amount. Deposit amount of Rs 5000 & above, Get 50% Bonus. Maximum Bonus upto Rs 4000 in your account. This Offer is valid only for the Repeat deposit made by players on RummyCulture & would have used only one specific offer while doing the add cash. Validity: The offer is valid only till next couple of hours only. Offer value: Super Bonus amount up to a maximum of value when a player Adds Cash between the Price range (Refer to the table mentioned). E.g. 2: If you deposit ₹ 8,000 & above, the maximum you will be eligible for is ₹ 4000. Minimum cash to be added for availing the offer is ₹ 5000. Maximum Bonus amount is ₹4000. Claim Period: The Bonus must be earned (disbursed) within 15 days of adding cash during the validity of the offer. Only One offer will be applicable at any given time, If any other bonus is used, bonus credit will only start after the completion of first offer. Disbursement of Bonus: It will be disburse after each game that you play on Rummyculture.com. For instance, if you add ₹ 8000 to your account, you are eligible for a total Bonus of ₹ 4000. 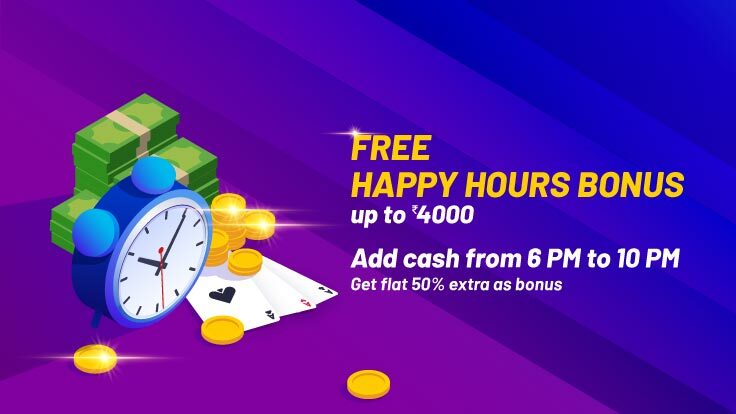 You will start receiving your bonus right after your first game, The bonus will be 5% of what you have played for an aggregate entry fee of the cash game For example If you entry fee of game is Rs 100 that you have chosen to play the bonus will be Rs 5 that will be credited as chips . Once you play for another ₹ 100 entry fee game, we will credit the second Bonus of Rs 5 to your account, and so on till a maximum of ₹ 4000 Bonus has been added to your account. One Account: One player can have only one account on RummyCulture.com. If multiple accounts are detected, the entire amount on all accounts will be canceled. The Terms of Service are applicable to all services offered on RummyCulture. Any violation of the Terms at any stage may result in disqualification from receiving the bonus and other action by Rummyculture as may be deemed necessary as per the Terms of service.